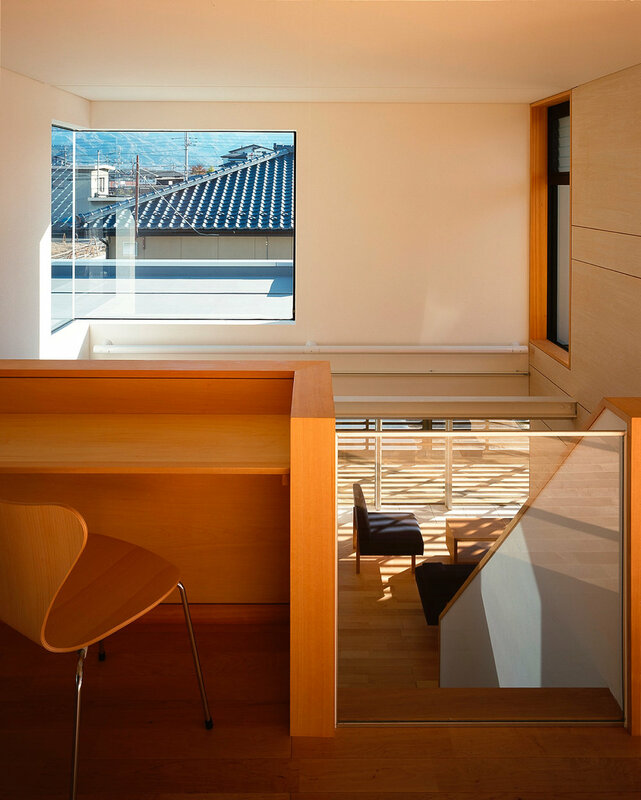 A house for an elderly working couple located on a site in the Kofu Valley adjacent to a vineyard and with a view to the distant Mt. Fuji. The house was planned around the concept of creating a circulatory space that draws in views to the surrounding landscape. e scenes visible from inside the rooms shift variously between distant- and near-views following one’s movement and the interior space is felt to extend horizontally out into the neighboring vineyard. The building exterior combines black-painted cedar boards and white-mortared surfaces in reference to the traditional designs of the local cedar-clad dwellings and mortar-finished warehouses. By varying the way in which the materials were combined, the front side facing the road was given a reserved and formal appearance, while the vineyard-side consisting of variously-sized windows was made to feel more open and informal. Most of the living functions of the house are serviced on the ground floor level in consideration of the couple’s old age. e upper level, which has a rooftop terrace, is intended as an annex space to be used for guests and pastime activities. copyright (C) 2018 Kasuya Architects' Office. All rights reserved.